OB Rag readers who participated in our most recent poll, voted overwhelmingly to keep the current “hippie floral” design on the OB Hostel on Newport Avenue. 67% of our readers want the new owners of the hostel, USA Hostels, to keep current paint job. 22% of those who responded want to see the exterior painted over. Seven per cent had no opinion. In a recent post by our writer Matthew Wood on an interview with the new staff of the hostel, the issue was raised whether the new owner and its management would paint over what Wood called the “OB-esque Hippie Floral Design”. So, we decided to run the idea by our readers and allow their voice to be heard. We divided up the responses between “residents” and “visitors”, and of those who identified themselves as “residents”, 65% want to “keep the current paint job – it’s very OB” (43 votes of 66). Of those who identified themselves as “visitors”, 88% voted “please keep the hippie design” (15 votes of 17). 2% agreed with the option: ” I’m not a resident or a visitor, but I say keep it. – 2% ( 2 votes )”. There was a total of 85 poll participants. Of course, this is a very unscientific poll, but it does give us an idea of what our readers think about the issue. 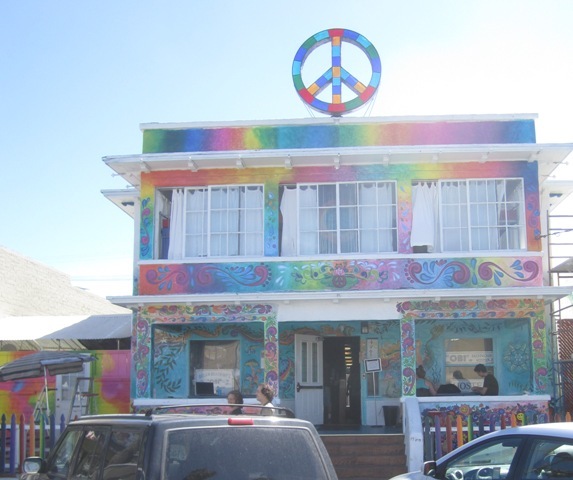 The new owner of the OB Hostel, USA Hostels, is considering painting over the exterior “hippie floral design”. What do you think (please review all options before deciding)? Newer Article: New OB Rag Poll: What do you think about a “round-about” at West Pt Loma and Bacon?